Sometimes I like to imagine a world where all landing pages are pre-optimized. A world where we don't need lengthy A/B testing, redesigns, or rewrites. In my fantasy world landing pages come pretested for specific audience segments and perform perfectly once published. But back in the real world the story is never perfect. The landing pages we produce are never perfect. And the results we get are never perfect. Sadly I can't hop over and help you test every landing page you produce. I can't tell you what will work for your specific audience or industry. What I can do is inspire you. 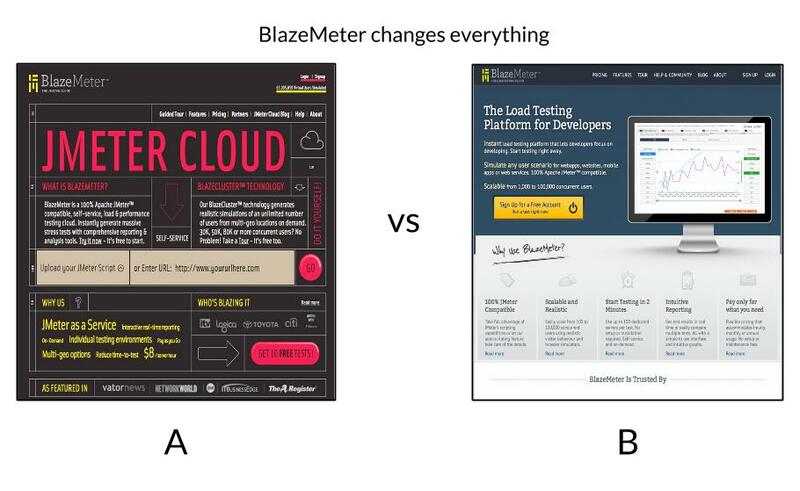 In this article I'll take 17 landing page examples from around the web (as representative as I can find), dissect them, and give recommendations on what they can A/B test to try to improve. I’ll be giving a few examples for click-through landing pages and a few for lead-generation landing pages (for both sectors). I'll also be giving you some bonus real-world case studies and back every one of my A/B testing recommendations with an example. Good to go? Let’s get started! Gummicube’s market is a very niche one, and one unlikely to be needed by anybody who doesn’t know it exists. That’s why it’s interesting they’ve chosen to do so much education-based content on this click-through landing page. It’s a relatively simplistic (though not bad) page. Many of the visual elements feel a bit amateur, and look like they were made in Google Drawing. Add an expand chevron for the “Key ASO Factors” as this section feels overlong and somewhat unnecessary for a simple click-through page. Change the formatting for the two benefit points in the “Content Optimization” section as they look exactly like buttons (but aren’t). It’s essential you have limited buttons on your landing pages, and nothing that looks like one but isn’t. Change the subheadline “App Store Optimization Service” to something which expands on the main headline and communicates the value of their service. Add a customer testimonial or a “brands we’ve worked with” section to help with their lack of name-brand recognition. Email app AwayFind increased their signups 91% by changing their landing page’s subheadline. The landing page itself is colorful, friendly, and interactive. Every icon is animated and it features four of their smiling employees front and center below-the-fold. They’ve also put a heavy emphasis on customer testimonials - an element I really like (and recommend) for lesser-known businesses. The page has a single conversion Ask (start a 30-day free trial) offered in their minimalist nav bar, beneath their intro video, and at the bottom of the page. I really like Vzaar’s use of headlines and subheadlines. Their headers are simple and succinct and their subheadlines add value. Put even more energy into their intro video. It feels a little bit forced, and, given that they’re a video hosting site, a great video is absolutely crucial. Change the headline from “We are video hosting for publishers” to something which sets them apart from competitors a bit more. Set the customer testimonials off from the green background with a contrasting (or dark) background. Change the CTA color to one of the brighter colors within the “built or real business needs” section (the orange or the pink). Marketing company CityCliq increased conversions on their pricing page 90% by changing their headline. Because of the incredibly appealing Ask on this landing page, I’m not entirely sure why they’ve added all the rest of the information. It doesn’t add to the appeal of the CTA. SEMRush does a great job breaking up the info on this page into palatable pieces. You don’t want to overwhelm your landing page visitors with information or they’ll bounce. For more on the psychological effect of “information overwhelm” check out Chapter 6 of The Complete Guide to the Psychology of Conversion Optimization. 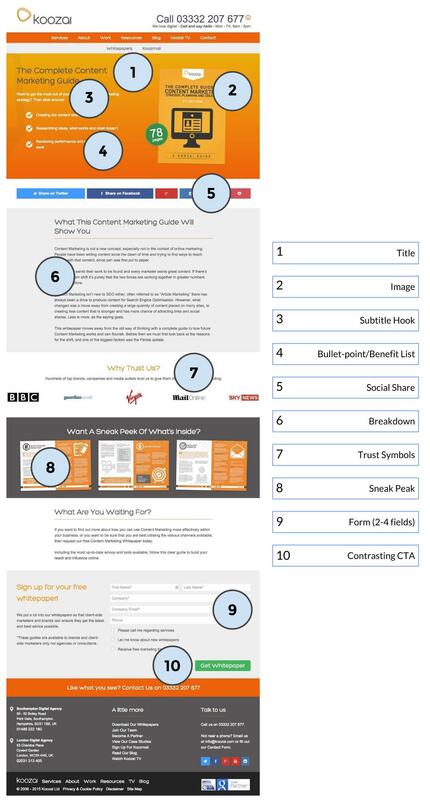 Remove the below-the-fold information (or most of it) to focus visitor’s attention on the very appealing, and easy, conversion Ask. Change the CTA button color to a blue similar to the mountain section. The green against the orange is pretty aggressive. Change the landing page image to something more interesting (even a graph showing growth). The stacks of paper aren’t particularly eye-catching. They’ve tapped into user quotes extremely effectively, using them in almost every section (even to the point of having a quote as the subheadlines of their benefit list). The design is good, and appears to be an excellent use of a landing page template from a third-party platform. I really like that they have one single CTA (try now) at the center of their click-through page. While they do have another button at the bottom of the page, it’s gray, smaller, and clearly not the page’s focus. Their USP (unique selling point) “The #1 Rated Field Service Business Management Software Since 2007” is a great example of a trust-based headline, encouraging traffic to find out why. Test a static image beneath their headline/USP. Currently it’s a series of high-quality gifs (one of which is sparks flying off a welder’s tool) which distract from the message of the page. Change the CTA button color to contrast a bit more. While the lighter blue is clearly visible, it doesn’t catch the eye as well as an orange or green would. Add the companies of the three testimonials at the bottom. Currently it reads simply “owner” which doesn’t communicate much. You want to show your landing page visitors that your successful customers are like them. Personalize your testimonials as much as possible to do this. Change the thumbnails from the faces of the person giving the testimonial to simple graphics (see more on this controversial a/b test in the bonus case studies section below). Adding a bright "Free Quote" CTA button to Consolidated Label's homepage improved conversion rates by 62%. To be honest, I’d say this company, Koozai (a digital marketing business focusing on agencies) has read a comprehensive landing page best practices article and then thrown them all into one landing page. This is a bit like cooking though... just because peanut-butter, jello, steak, cheetos and a good pale ale are all amazing doesn’t mean mixing them together in a food processor will give you a delicious dinner. In my mind, lead-gen landing pages should be simple and to-the-point (like all landing pages, actually). This one is not. Put the CTA button above-the-fold, as most people don’t scroll down. Lose the “Why should you trust us?” section, the long gray paragraph section, the “What are you waiting for?” section, the top nav bar, the phone number and the bottom contact details section entirely. Move the bottom form field to the right side of the page and make the image smaller. CRM company SuperOffice increased lead-gen on their demo request page 197% by taking "less-is-more" to heart. The high-quality visuals communicate professionalism very quickly (as soon as you come to the page). There’s great use of an expand section (the form shown on the right in the image above opens up when you click one of the CTAs. Really good focus on the conversion Ask: no top nav bar and three very different CTA buttons (the orange “Get the Guide” CTA, the “download the guide now” link as well as the ebook picture are all CTAs which open the form). Reduce the number of form fields unless you’re using every single one of them to nurture leads into sales. Leads are particularly scared of giving their phone number to anyone, so asking for it will be severely limiting the number of leads this page is generating. Copy-edit the ”About us” section. There’s no period at the end of the pitch, the word “help” is repeated obviously and there’s a dependent clause used as a sentence. This stuff matters, particularly as the rest of the page is so professional. Eliminate the logo link unless the landing page visitor already has an account (which can be tracked with cookies and a good marketing automation tool) as they may get curious about the company (especially with the “about us” section) and bounce from a page optimized for conversion to one not so. Add a small image of the quoted customer beneath the testimonial. 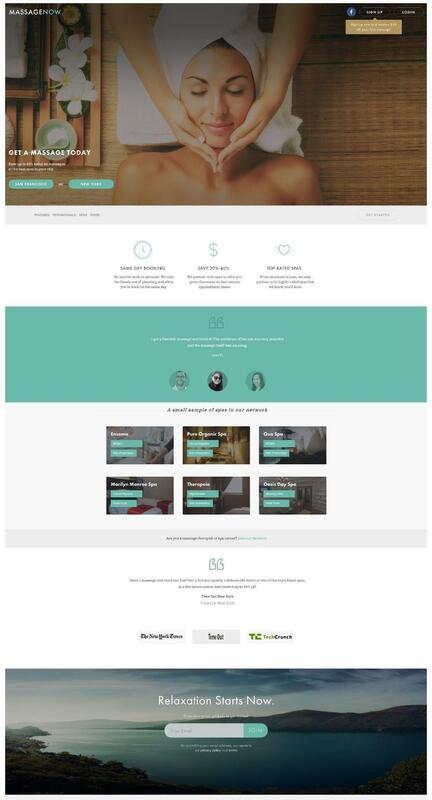 ContentVerve increased conversions by 64.53% by changing the placement of their testimonials. This is one of the simplest landing pages in this entire guide: a straightforward USP and great subheadline which expands on their offer, an image, a few “trusted by” previous customers and the form - clean, minimalist, effective. Clearly, though, the focus is on that form on the right (which is the reason I’ve categorized this page as a lead-gen landing page). 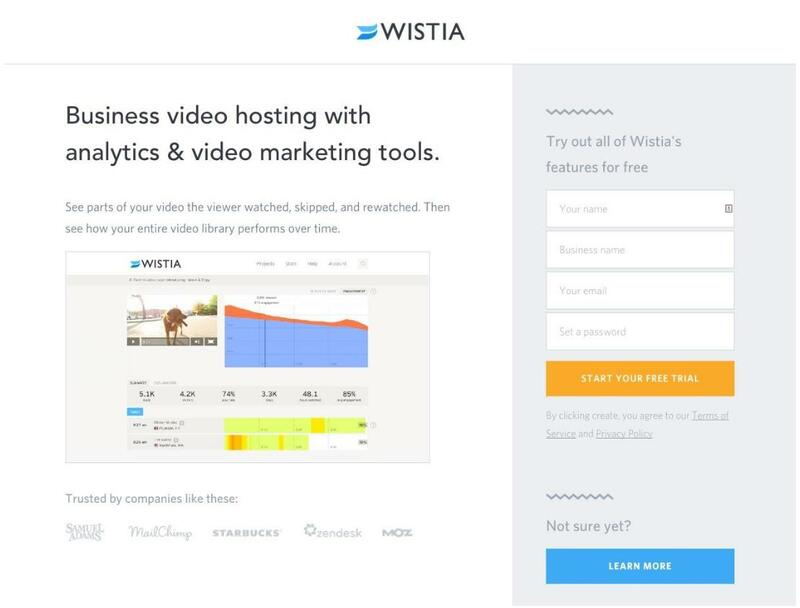 Especially effective is the form’s headline “Try out all of Wistia’s features for free”, which does a great job of letting visitors know that converting on their Ask doesn’t mean they have access to some small freemium version of the Wistia platform, but every feature they offer. This appeals to “shopping-around” visitors (which, as this is the landing page of a Google Adwords campaign, is going to be most of the traffic). I like the “Not sure yet?” Ask on the bottom right, allowing visitors to check out the full website and get a better feel for the tool before starting their free trial. Normally I’d recommend against a second CTA within an LP, but (as this is half click-through page and half lead-gen) I’m happy with it. Their choices for companies that trust them are exceptional: Samuel Adams is recognized by everybody as a simple beer company (B2C), Mailchimp is recognized by all marketers no matter their industry, Starbucks is recognized as a leading big brand (and communicates Wistia’s reputation as a leader in their field), and ZenDesk and Moz appeal even more than Mailchimp to the discerning digital marketer. Change the image to something more engaging, like a gif or introductory video. This page is very simple, and I’d be interested to know if a little showing-off wouldn’t help conversion rates. Change the “Learn More” CTA button to be a little bit less visible, given that the free trial is the primary goal of this page. Remove the “Set Password” field within the form, as this feels like a sizeable commitment. Once you’ve gotten the lead you can ask for a password in an email or internal message. Using an image instead of a blank background has resulted in a 70% higher conversion rate. 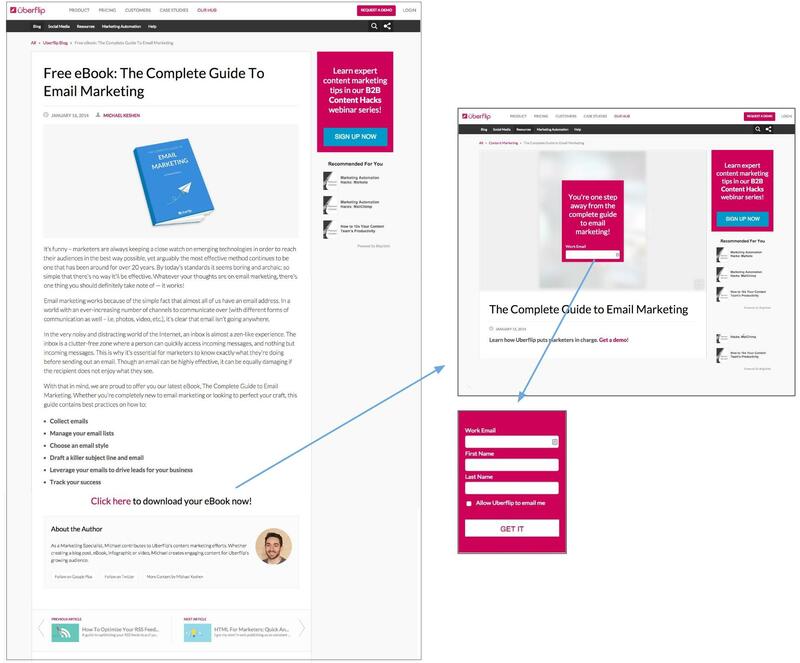 Firstly, prospective leads read the ebook breakdown (paragraph form, like a blog article), then they click the “click here to download” CTA, which opens a new tab in their browser. Then they click on the first form field (work email) which acts as an expand chevron to open up the other couple fields of the form. One thing I do like about this landing page process is the second stage, which appears like a website popup over the top of what looks like the ebook itself with the copy “you’re one step away from the complete guide to email marketing.” This gives the landing page visitor the feeling that they can almost grab the ebook and taps into "sampling" (a powerful psychological factor in marketing). I like the author bio at the bottom of the page (although it’s probably simply a leftover of the blog article formatting) as it makes engagement a bit more personal. Create a few shorter bullet-points to replace the paragraph format. It’s either a blog article or a landing page, not both. Remove the sidebar as it distracts from the primary conversion goal. Show the full form when visitors traffic to the other tab rather than expanding it upon clicking. Use a click popup for the “Download the Complete Guide Here” link instead of a whole new page. Don’t require prospective leads to receive emails (the form won’t complete unless visitors opt-in to the newsletter) as this will be severely hurting conversion rates (and is also a legal gray area). Underwater Audio increased sales on their product page by 40.81% when they added personal benefits. Simple and to the point, this lead gen landing page has a large centered title, ensuring there’s no confusion about what webinar you’re going to get when you download. The webinar host’s faces, names and job titles are prominent, a great idea (particularly for webinars) as it personalizes engagement. 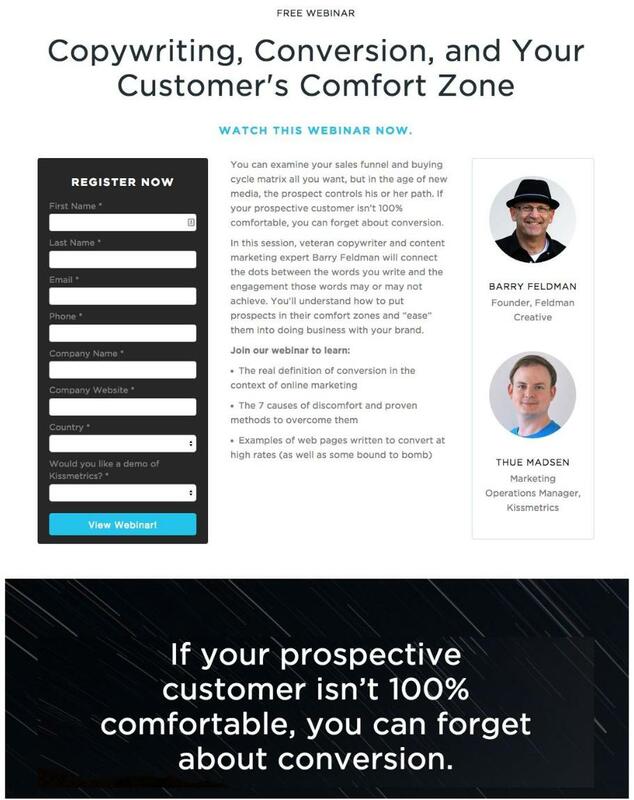 The quote at the bottom of the landing page is also an effective sneak-peek into the webinar itself. Beautiful color scheme, eye-catching CTA button, solid intro and benefit list, and a traditional layout (with a few bonuses) gives an all-around highly-optimized lead-gen landing page. Fix the off-set image behind the quote at the bottom, as the background doesn’t line-up with the layered image on top. Little details matter. Neil Patel boosted conversion rates 26% by removing the “revenue” form field on his site. This page features even more side-bar distractions than UberFlips, but places the form front and center on the page. One of my favorite parts of this landing page example is the sentence right before the form, “By downloading the e-book, you’ll also get access to three customizable templates that are described in the guide.” This kind of “bonus content” is a great idea for lead gen. The benefit list beneath the form is also an interesting choice, as normally you’d communicate all the value of your offer prior to throwing the offer at your prospective lead. The form itself is a dual-Ask, as the CTA is “Sign Up” in which you get both the ebook and subscribe to the newsletter. Place the benefit list above the form, to complete the value pitch before the Ask. I’d drop the required newsletter subscription from this lead-gen Ask, particularly as it’s entirely possible to be interested in the ebook prior to seeing the value of a newsletter subscription. This ebook is the fourth link on the first page when you type “influencer marketing ebook” into Google. For organic SEO traffic, a reason for newsletter subscription hasn’t been adequately communicated yet. TechInsurance.com increased conversions 73% when sending PPC traffic to a simplified LP. Most people would think Version A (as the faces of real people are best practice) would win this A/B test handily. And yet, the video thumbnail with real customers decreased views by 50% at a 99% confidence level. Surprised? You wouldn’t be alone. Apparently, after interviewing and surveying customers, AutoDesk (a 3d design and software development company) found that people were more interested in learning how the software worked than they were about hearing people talk about it. Just goes to show you can never assume (and how important it is to test everything, even those strategies you think are guaranteed improvements). Time Doctor, a software company creating time management and productivity tools, ran this test on their pricing page exclusively on people who had been to other pages of their site first. Version A (“Free 30 Day Trial on All Accounts”) converted 32% more visitors than Version B (with a 98.9% confidence level). The conversion was actually filling out a form field on the following page (so not clicking the CTA button in the image above). 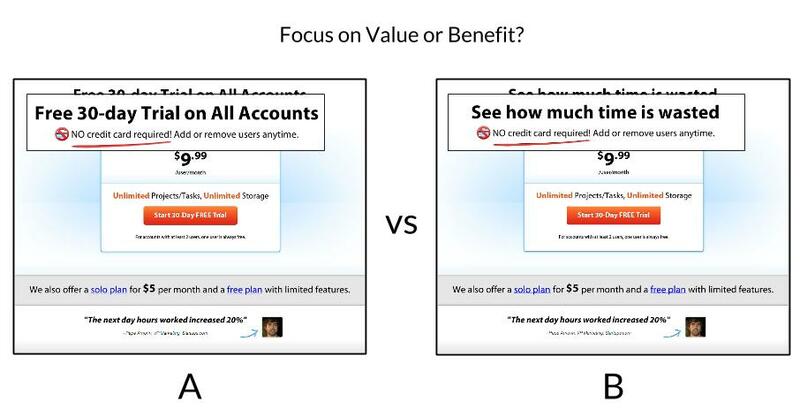 This one is a great test, as both “focus on value” and “focus on benefits” are CRO best practices. Are you surprised? Let me know your thoughts on these case studies in the comment section! I love this landing page’s focus on visuals. The first thing you see is a relaxed woman smiling while having a massage. You know you’re in the right place. A simple, three-part benefit list right above the fold gives you three of their primary selling propositions (“same-day booking”, “save 20-40” and “top rated spas”). These three benefits effectively answer the first questions of site visitors: When can I get a massage? How much will it cost me?, and Will it be worth my money? Anticipating and answering your landing page visitor’s questions is a great way to get a conversion, fast. Have one click-through landing page for San Francisco and one for New York. Most landing page tools> make it easy to duplicate a landing page. Keep the design elements identical but target your online advertisements by location. Apart from that I really have no improvement recommendations for this landing page. It’s excellent. Online ad campaigns that use landing pages typically see a conversion rate improvement of at least 25%. Front and center is a trust symbol (it actually loads first on the page), which puts the landing page visitor at ease right off the bat. The page struggles a bit with readability, as the font in the scrolling section ("Adjustments and Manipulations") doesn’t contrast as well as it could against the green background. The central body copy is, again, very typical of sites like this one. The three paragraphs take up a lot of space and could be overwhelming the visitor. A few nice touches though are the video (actually done pretty well) and the Yelp reviews. For a business like this one, featuring objective reviews from a recognized site is a good call. Replace the three paragraphs with the video (and make the video’s thumbnail more appealing). This will make the page simpler and encourage engagement with a really pretty good video. Remove simple errors to improve conversion. The trust symbol text reads “congratulations [...] on being the on top Physical therapist…” and the “Read More” link in the image section doesn’t link to anything. Remove random “print” button on the right side above the body copy. Simple web design errors communicate an unprofessional business, which visitors extrapolate to your services as well. Growyourowngroceries.com replaced a photo of the owner with a video and increased conversions by 12.62%. I’ve chosen to include this page within this article because it’s very typical of B2C sites (though isn’t, technically, a landing page optimized for a single online conversion). 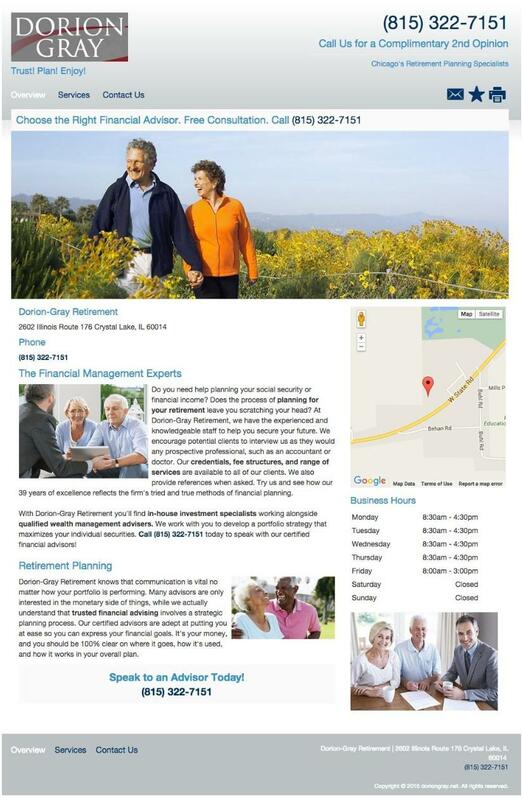 Like many of its peers, Dorion Gray’s site features a phone number in five places as well as a map and address, allowing visitors to immediately take the conversation off-line. This shows a knowledge of the company’s target market. The page also features several stock photos of retired, smiling couples (again, typical of sites like this one). Brainstorm a USP to set your business apart from competitors. Consider bringing the “39 years experience” from the body copy below into a headline. Ask previous or current clients if they’d be willing to be photographed for the website. The left side and bottom right images, in particular, feature two men (not Dorion Gray) helping an elderly couple. This would be far more effective if they hadn’t been bought for $5 from a stock photo website. Feature Dorian (or someone from the company) in person, either with a picture of short video. This will create trust between the visitor and the company. Add a customer testimonial (with picture and name) to develop trust. A company offering truck-driving classes increased conversions 161% switching from stock photos to real people. 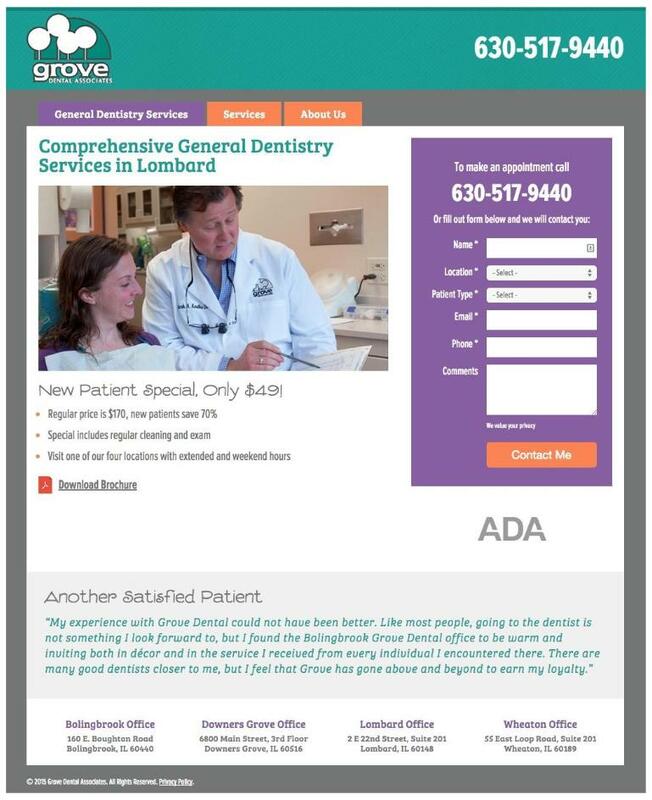 This landing page is specific to its Adwords campaign, focusing on the keywords “dentist + Chicago.” Which is why their value proposition/USP is focused on the value they can deliver to new clients. Existing clients would head to their main website, and see a different message. Focusing your USP on your traffic source is definitely best practice, and should be kept in mind. Everything essential is above-the-fold while below-the-fold is a prominent and glowing customer testimonial as well as smaller contact details for each of their four locations. I really like how this page is structured. Change the color of the “services” and “contact us” links in the nav bar so the CTA button in the form stands out individually. Change the font of the body copy and customer testimonial as it’s too childish and (particularly the testimonial) somewhat hard to read. Add context for the “ADA” trust symbol on the right (like “member of the American Dental Association”). Add name and image of the quoted customer. NumaraSoftware improved form conversion rates 133% by changing their font from size 10 to size 13. There’s a lot going on here, but my eyes find the phone number right off the bat (the goal of any B2C page like this one). 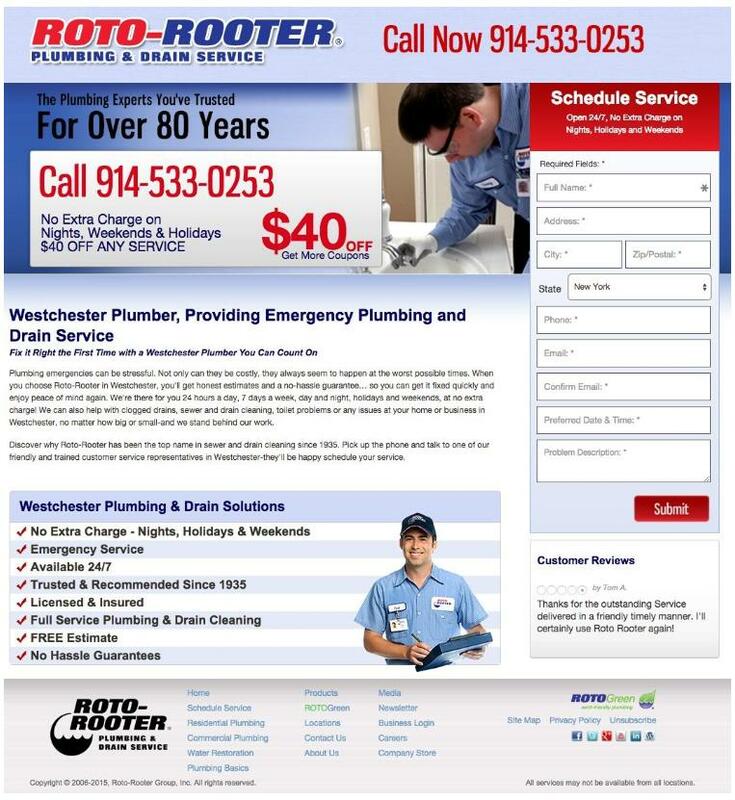 The images look like real roto-rooter employees, and I like the headline “The plumbing experts you’ve trusted for over 80 years” as it communicates that my friends and family have trusted this company, so I should as well. The $40 discount is also an effective communication of value beyond their competitors, and is front-and-center on the page. I’d make the headline one size and line. Breaking it up like they have isn’t optimized for reading. Make the Customer Reviews section a bit more prominent. Make the five stars more visible and add quotation marks (which communicate authenticity). Change “submit” to something more appealing, like “Get it Fixed!” In fact, never use “submit” at all, ever. Empire Flippers increased lead-gen conversions 33.10% by making their CTA copy more customer-centric. Once again I’m a bit thrown off as to why you wouldn’t just create two landing pages for each of your locations, but let’s put that to the side for a second. The first thing that hits you when you arrive on this page is an almost overwhelming amount of text. It’s genuinely a bit intimidating (especially when they should be making engagement as simple and painless as possible for a sensitive target market). 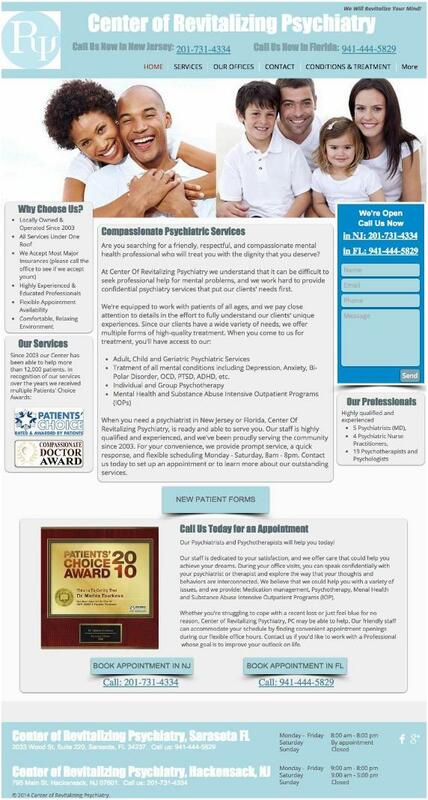 The bottom left image (currently showing the “Patient’s Choice Award ‘08” image is actually 13 images which scroll every 6 seconds. I screenshotted the trust symbol image as I think it’s worth mentioning that unless your business was voted “Top X Business” in the past two years, don’t include it (as it makes it look like you’re searching for things to brag about and coming up short). This page does have a cool feature in their phone number link, which actually opens up a Facetime option. That said, I’d be interested to see if this little feature didn’t simply intimidate visitors rather than making it easier for them to engage. Remove awards won before 2013. Remove third and fifth paragraph from body copy as it’s currently too much text to take in at one time. Change form headline (“We’re open. Call us now”) as it immediately makes me disbelieve you. If it’s 11pm on the west coast, there’s no way you’re open in New Jersey or Florida. Remove stock images of overly-smiling families and couples. Feature real, caring psychiatrists instead. Remove “New Patient Forms” CTA button, or add context. Spreadshirt reduced the amount of text, graphics and CTAs in their “how to” section and increased conversions by 606%. Her face and signature are at the top, immediately engaging people with a smile and making the whole interaction with the page personal. The webinar’s title is a “how-to”, immediately appealing to people who want to learn something from an expert. You’re told in no uncertain terms that you’ll get the complete picture of how to get up and running. Solid subtitle as well which expands on the initial headline. Making it personal with “you” right off the bat. Also effectively answering the main question people have when they arrive on this page: “Is it for me?” to erase fears and concerns. ”I can’t wait to see you there” reaffirms the personal touch. Bright yellow, large CTA buttons repeated twice: once at the very top for people who know they want to register and once after the bullet-pointed list of “what you’ll get” below. The testimonials are almost an afterthought, but there are enough of them and feature the faces and name of the person giving it. If you’re not already sold on the “what you’ll get” then the testimonials will do it. The CTA button remains at the top of your screen even if you’re completely scrolled to the bottom of the testimonials, so you can engage easily. 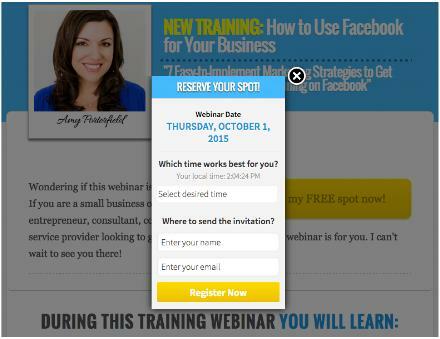 All of these elements make for a well-optimized (and often-tested) webinar [landing page](https://blog.wishpond.com/post/115675436105/landing-page-design) which has worked for Amy for a couple years now. VWO (an A/B testing tool) tested popup forms on their free trial signup and improved conversions by 50%. Pierre et Vacances (a French hotel and vacation-booking site) ran this CTA-only A/B test for 12 days. Their control (the CTA copy “Book”) was compared with a softer “Check Availability” CTA, which increased clicks by 92% and (more importantly) hotel bookings by 13.6% - both at a level of statistical significance. You often see soft CTAs improve clicks, but actually hurt sales in the long run (usually because the traffic clicking through to the next part of the sales funnel is not qualified). This test shows exactly how important it is to measure your A/B tests to the end of the funnel, particularly when testing your CTA text. Any company that stops at clicks and makes a site-wide change based on such a shallow metric runs the risk of hurting their bottom line (down the line). Another great test (in the same vein as the one above) comes from Alinc technologies, a full-spectrum IT solutions provider, who tested “add to cart” vs “buy now” copy in their CTAs. 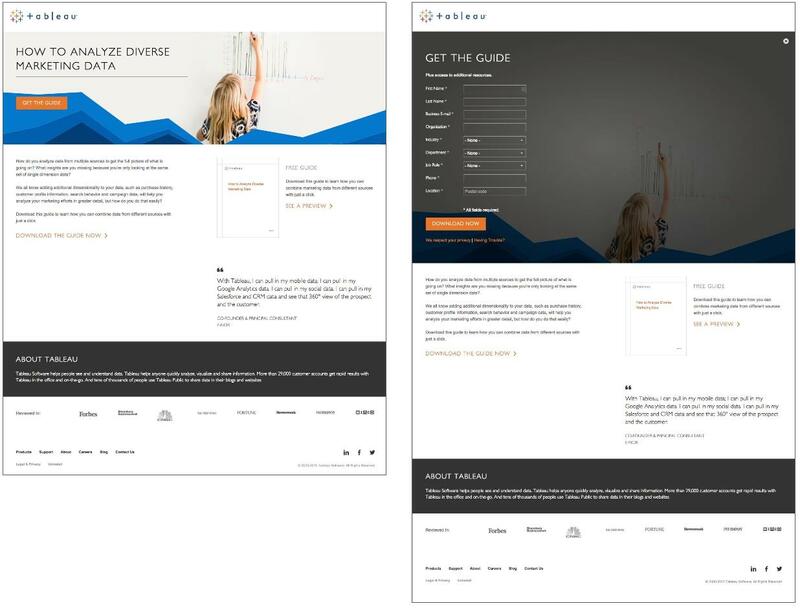 As you can see, this was a complete overhaul of (Blazemeter’s homepage) (they’re a SaaS company which provides website performance testing). Version B increased leads by 119%. However, the actual revenue increase was only about 11%. Why? If your business has a longer sales process or lead nurturing period, it doesn’t matter how many leads you generate if your strategy for nurturing them into sales isn’t up to snuff. And that, my friends, is why you need to set up an optimized landing page and then ensure you have a strategy for how to convert those leads. Otherwise you’ll have invested some serious time, money, and energy for nothing. Special Mention: ConversionXL's article on sample pollution in A/B testing. I hope this guide has given you a better idea of how your own landing pages can be optimized for the conversion you need. Were there any kinds of landing pages (or sectors) I missed that you want me to cover? Let me know in the comment section.